Name : Hina Altaf Khan. Profession : Actress, Model, Video Jockey, Host. Date Of Birth : 24 October 1992. Age in 2018 : 26 Years. Birth Place : Karachi, Pakistan. Home Town : Karachi, Pakistan. Brothers : She has two elder brothers. Weight : 50 Kg / 120 Lbs. Hair Colour : Light Brown. Figure : 34B(Chest) - 28(Waist) - 34(Hips). Shoe Size : 8. (Approx). Schooling : Beacon house School System, Karachi. University : Iqra University, Karachi. Degree : Graduate in Mass-Communication. Singer : Nusrat Fateh Ali Khan. She is not rumoured with any one, till now. 40K for an Episode. (Approx). Hina Altaf started her career in her Childhood, by doing modelling in local fashion Shows, after completing her Studies, She did commercials for some big brands like Olpers, and Nishat Group of Industries, etc. She did some work as a Video Jockey on Ary Musik. She has also hosted the famous morning show of Ary News, When the host Sanam Baloach was having some personal issues. She is a very talented actress and looks very young, as compared to her age. She is having a huge fan following on her social accounts. 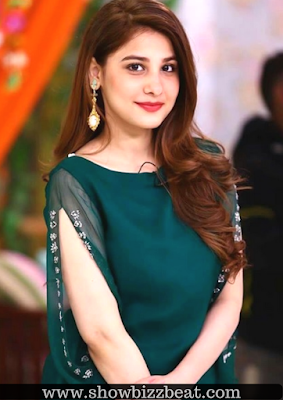 Currently she is doing a Serial titled "Aatish" Opposite to Azfar Rehman. She has a tattoo on her right hand which is a name of her Doctor "Alam" who helped her getting back to normal life from a life of depression. She considers Dr.Alam as her Guru.